Effective project scheduling plays a crucial role in ensuring project success. To keep projects on track, set realistic time frames, assign resources appropriately and manage quality to decrease product errors. This typically results in reduced costs and increased customer satisfaction. Planning and scheduling are distinct but inseparable aspects of managing the successful project. The process of planning primarily deals with selecting the appropriate policies and procedures in order to achieve the objectives of the project. Scheduling converts the project action plans for scope, time cost, and quality into an operating timetable. The translating of the project criteria for scope, time, cost, and quality and the requirements for human resources, communications, risk, and procurement into workable “machinery” for the project team a critical interface juncture for the project team. Taken together with the project plan and budget, the schedule becomes the major tool for the management of projects. In addition, the integrated cost-time schedule serves as the fundamental basis for monitoring and controlling project activity throughout its life cycle. This basic level paper addresses the integrated processes of planning and scheduling of multifacet/multidisciplinary programs. 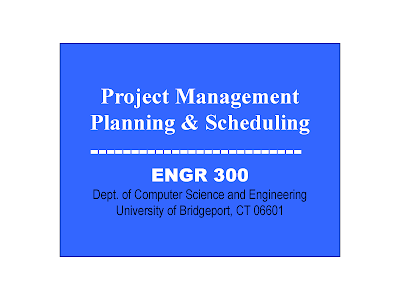 The paper presents a working level summary of the major Project Management topics involved in the planning process. The paper also details a systematic process for transforming the Project Plan into the Schedule and the use of the Project Schedule as a model for project control. Intended for the project management novice, the paper concludes with a suggested professional development scheme.